The Chimney Fire torched 46,344 acres of North SLO County, destroyed 49 homes and cost millions in 2016. But how did it start? FIRE ON THE RANGE The Chimney Fire began on remote rangeland owned by Monterey County Water Resources Agency. Shortly after Loretta Borges saw the column of smoke wafting from the remote land behind her ranch, she saw two men in a truck barreling up a dirt road in her direction, honking the horn. She described them to fire investigators as "in shock." But as the smoke plume grew, the men got out of the truck and scrambled to help remove flammable materials from around her property just south of Lake Nacimiento. "No one asked them to stay," Borges would later tell fire investigators. "And they made no effort to leave." The time was 4:03 p.m.; the temperature, 100 degrees; the drought, five years in. Earlier that morning—Aug. 13, 2016—Borges let the men use her gate to access the ranch road that meanders westward into the backcountry, through property predominately owned by Monterey County. When the men first came face to face with the grassfire a mile or so west of the ranch, it was about the size of a football field. They tried to fight it with an extinguisher—to no avail. The fire had spread to 250 acres by the time emergency crews first arrived at the scene. It would take 24 days, thousands of firefighters, and a California state of emergency declaration to ultimately contain the Chimney Fire, which is the largest wildfire to hit San Luis Obispo County so far this century. When all the soot settled, it scorched 46,344 acres. 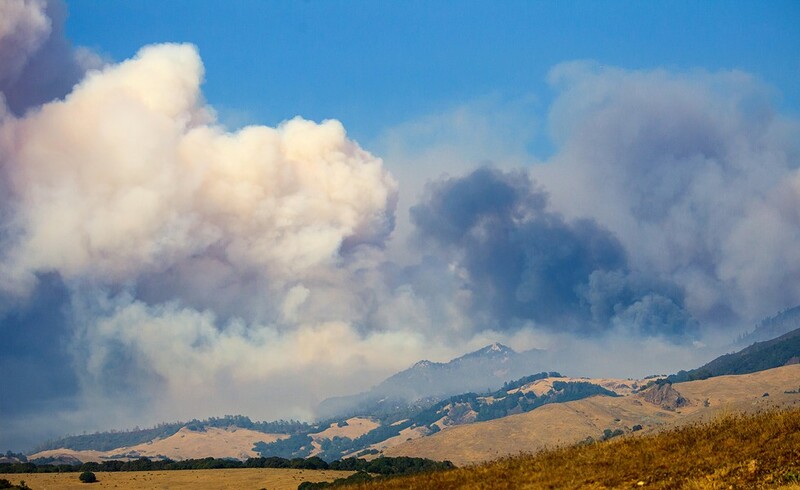 "Five, six years of drought conditions," said Chris Elms, a Cal Fire SLO public information officer, "and it just became a tinderbox." Nearly 4,000 firefighters from across the state responded to the Chimney Fire, which destroyed 70 structures—49 of those were residences—and came within 2 miles of Hearst Castle. The estimated property damage is $12.2 million, according to Cal Fire. But information about its cause has been tightly held. In the initial period after the fire's outbreak, officials said they'd determined the fire wasn't arson. Seven months later, on March 29, 2017, Cal Fire announced the investigation was over, and the cause was "a vehicle that ignited dry grasses next to a dirt road"—without providing further details. New Times asked for the full investigative reports behind the fire. All the details published in this story come directly from the reports. 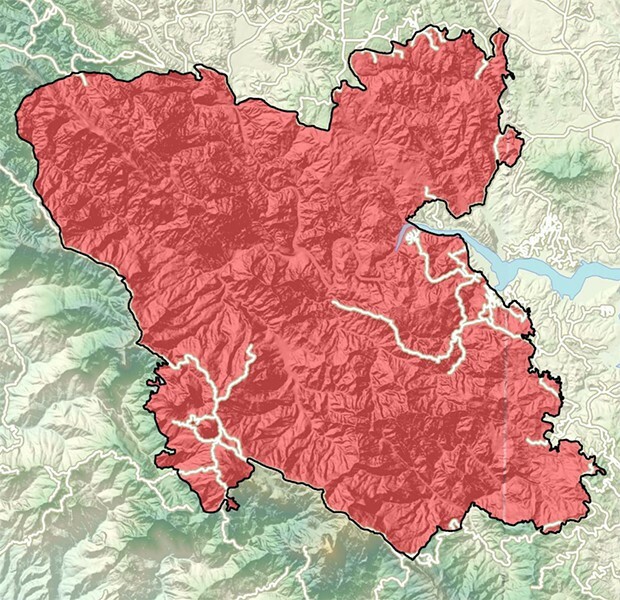 With wildfire season in full swing again on the Central Coast this summer, the circumstances unearthed in the Chimney Fire report shed light on some of the hazards and precarious land use dynamics at play out in the most remote, and flammable, areas of SLO County. Fire officials reported that the Chimney Fire was sparked by a 1992 Ford F-350 going through rangeland owned by the Monterey County Water Resources Agency, driven by two men who were scouting deer on the second day of deer hunting season. Paul and Gary Atkins borrowed the truck on Aug. 13 from Schlegel Sand and Gravel in Atascadero, their employer. A man who identified himself as a manager or owner at Schlegel confirmed that fact to New Times, but added that he had no knowledge of what the car was being used for. He instructed New Times to reference the Cal Fire report, and hung up the phone. According to that report, the men arrived at Borges' ranch in the morning. Borges declined to be interviewed by New Times, but her property is the most westerly residence in that area that has access to the main public road: Running Deer Road. "Get any ... information from Cal Fire," Borges wrote in an email. "Anything else would just be speculation or rumors—and there were tons of rumors going around." Investigators later learned that the men were given permission by another area landowner to scout the deer hunting conditions, and to "be on his property to gain access to another property." David Batdorf owns several hundred acres of land some miles west of Borges' ranch, and reportedly has an easement that runs through the publicly owned land in between. The Atkinses initially told investigators they were in the area "to repair a road" for Batdorf, a task which Batdorf did not corroborate in the Cal Fire documents. Contact information for Batdorf could not be found, and it was redacted from the investigation reports. The men drove out on ranch roads "as far as they could until the road became unpassable" and "continued on foot for a while and returned," the Cal Fire report stated. Driving back, at one point, they "had to drive in the grass for a bit because of a large ditch in the road." The truck's "tires spun a little in the dirt while doing this," the investigation report read. They then stopped at a pond "to stretch" and to "look for tracks," which is when they observed smoke coming up from behind them and realized that a fire had started. 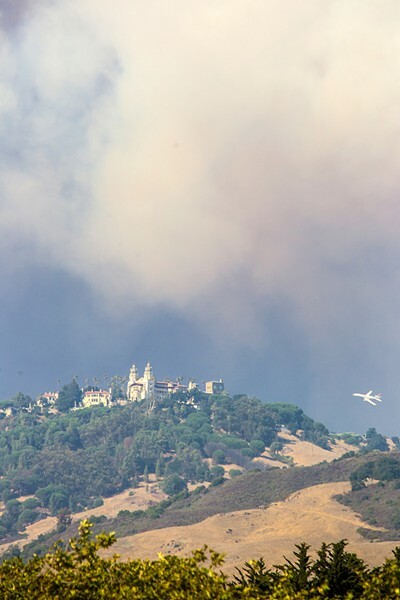 SAVE THE CASTLE An air tanker drops fire retardant near Hearst Castle as the Chimney Fire came within 2 miles of the national landmark. The castle shut down to public tours for several days. The Atkinses confirmed to Cal Fire that they had driven minutes prior through the area where the smoke was. When asked who or what else was in the area at the time, the men said, "Ain't nothing out there but us." Investigators later found dry grass underneath the vehicle and "a piece of carbon inside the exhaust pipe stuck in the screen of the exhaust." Kevin McLean, Cal Fire's investigator, concluded, based on those facts, "the cause of the Chimney Fire to be from the vehicle Paul Atkins was driving. A vehicle was the only competent ignition source in that location." McLean was on vacation during the reporting of this story and could not be reached for an interview. The Monterey County Water Resources Agency owns the 485-acre parcel of land that the Atkinses were traveling across at the moment the Chimney Fire started. And it's not the only block of property SLO's neighbor to the north owns in the county. Monterey County has holdings on more than 60 large parcels scattered around Lake Nacimiento—totaling thousands of acres—all purchased in the 1950s to pave the way for the original construction of the reservoir. Many of those parcels were burned by the Chimney Fire. "The fire definitely torched our property down there," said Brent Buche, deputy general manager for the water agency. Monterey County manages the land today by leasing it out to private livestock grazers in seven-year periods. In return, the agency receives annual rent and land protection. The leases spell out the agency's land management expectations from tenants, like fire prevention maintenance and submitting quarterly reports. The grazers' leases prohibit recreational activities—explicitly hunting. "Not any schmuck can do this," Buche said. "You have to be in the grazing business and demonstrate your ability to care for the agency land. A lot of it is for caring for the land and fire control." The tenant on the parcel where the Chimney Fire started is local developer Darren Shetler, who's leased the land as Four Seasons Livestock LLC since 2010. Shetler did not return a request for comment from New Times. Buche said that hunting and trespassing are "huge" problems on the agency's properties. He said there's just a single employee tasked with checking up on all of its land. "We have these huge land holdings down there, and trespassing's an issue," he said. "We don't have people patrolling those leases. There are only so many resources. It's just a reality of a large land holding." While all the leases for Monterey County's holdings prohibit hunting, the parcel where the Chimney Fire started is home to an area known as Deer Flats—a large, open grassy area with a few ponds surrounded by dense oak woodlands. It's unclear from the investigation's reports whether the Atkinses were scouting deer on Monterey County's land, Batdorf's land, or both. The fire broke out close to Deer Flats. Shetler, the tenant on the property lease, told investigators the last time he'd been on the property prior to the fire was June 2016. He said he only allows one individual on the land (Steve Souza, who was not there that day, according to Cal Fire reports), and he "changes the combos on his gate frequently." BLAZE OF THE CENTURY The Chimney Fire burned 46,344 acres in North County, and marked the largest wildfire to hit SLO County this millennium. Nonetheless, the Ford F-350 wasn't the only vehicle out on Monterey County's land on Aug. 13. Earlier that morning at daybreak, another man was driving on the property in an unregistered Jeep with no catalytic convertor. He also told Cal Fire that during the morning, he heard what sounded like a "four wheeler and a motorcycle" close by. Later in the day he saw all-terrain vehicle (ATV) tracks that had accessed a hill peak on the property. In the wake of the fire's outbreak, Cal Fire also discovered fresh ATV tracks that had come through the area over the recently fallen ash. After the fire, the Monterey County Water Resources Agency staff "spent months" crafting new leases, according to Buche. He says the new documents make it "crystal clear" what's allowed on the property. The new batch of leases will all go out to public bid at once and will go in front of the Monterey County Board of Supervisors for approval on July 25. Determining whether prosecutors have a strong case to pursue criminal charges for sparking a wildfire is not as simple as asking: arson or accident? Arson is a clear crime. Accidentally sparking a wildfire can also be considered criminal if it's done "recklessly" or "negligently." "If it's an unintentional fire, then you're looking at what's called unlawfully causing a fire," explained Lee Cunningham, SLO County's assistant district attorney. "It requires certain recklessness, but it doesn't require an intent to start a fire. It just means you're reckless. We've prosecuted those kinds of cases." "Negligence" in starting an accidental fire is another transgression, and not as serious as recklessness. In order to prove criminal negligence, Cunningham said the act has to meet three criteria: that the person involved is aware that the actions present a risk of fire, that he or she ignores that risk, and that the action constitutes a gross deviation from what a reasonable person would do. Cal Fire has indicated it doesn't believe criminal recklessness or negligence played a role in the start of the Chimney Fire. The agency has not recommended pressing charges to the DA's Office, said Cunningham and Elms, the Cal Fire SLO public information officer. "If there was negligence, there would have been a legal process with it," Elms said. "And there was a lot of due diligence in this whole process. That's why it took so long to get the information out." "If the fire originates from the operation or use of any engine ... or any other device that could kindle a fire, the occurrence of the fire is prima facie evidence of negligence in the maintenance, operation, or use of such engine," the report quotes from Code 4435. "If ... it can be determined which person's negligence caused such fire, such person is guilty of a misdemeanor." Cunningham indicated that the issue could wind up in civil court, given the widespread losses that were incurred from the fire: Nearly 50 homes, more than 46,000 acres, more than $12 million in property losses. In looking at the issue, Elms sees it from a firefighter's perspective.